Pine forests were once common in this part of the world -- from New Jersey to Florida and west to Texas. It was a rich environment for a small and smart little woodpecker that is now endangered. Sandy Hausman reports on what happened to the bird, and why it’s now coming back. When settlers first arrived in what is now the American southeast, they found 90 million acres of mature pines – the perfect material for home and ship construction – and something that had to come down so the newcomers could farm. Today, only 3% of that ecosystem remains. The Nature Conservancy’s Brian van Eerden stands in the middle of a large preserve southeast of Petersburg, listening to a low, rustling sound he had to explain during a hike with his daughter Abigail. Nor does one often hear the call of the red cockaded woodpecker, a small bird with black and white bars on it back, a black crown, and in males, a spot of red above the cheeks. They’re remarkable birds really – reknowned for raising their young collectively, with helper birds joining parents to feed the young, and they’re the only woodpecker to nest in live trees – mature pines infected with a fungus that makes the wood soft. Birds make a 3-4 inch hole and then excavate a cavity where they can lay eggs and raise young. They also tap into reserves of sticky tree sap – spreading it along the bark outside its hole. But other factors have taken a toll – especially the loss of old trees to loggers and farmers. 85-year-old Mitchell Byrd is an ornithologist and founder of the Center for Conservation Biology in Williamsburg. He documented the progressive decline of Red Cockaded Woodpeckers in Virginia. By 2002, only 11 birds were believed to remain in Virginia – and just two breeding pairs, each needing 200 acres to forage. That’s when the Nature Conservancy stepped in. It bought 32-hundred acres of forest and began restoring the Piney Grove property – using controlled, low-level fires to remove weeds and brush that had grown over the forest floor. Years ago, van Eerden says, lightening did that job. They also reinforced the entrance, so southern flying squirrels and larger woodpeckers can’t enlarge the hole and take over the space. Because the population of red cockaded woodpeckers had fallen so low, the Nature Conservancy was concerned about a lack of genetic diversity, so it imported 25 birds from North Carolina, and today there’s a thriving group of more than 50 red cockaded woodpeckers in Piney Grove. To keep tabs on them, biologist Bryan Watts climbed six thin stackable ladders to a nest fifty feet above the forest floor, fished out two tiny babies, tucked them into a cloth pouch and carried them back down for a check up. He laid the pink nestlings on a burgundy bath towel where they stretched and complained. After a few seconds, one of them seemed to collapse. The field team weighed, photographed and banded each bird, then replaced the babies in their nest. Clontz says the timing was critical. 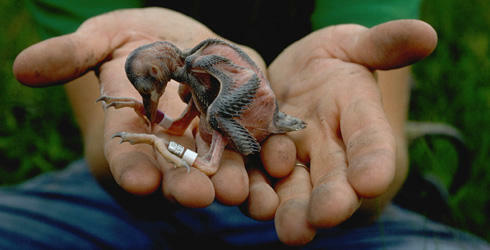 The birds must be 5-10 days old, when their legs are long enough for banding, and their eyes are closed. “Once they open their eyes, they can detect that it’s not their parents coming to feed them, and they lie flat in the bottom of that cavity, and they’re difficult to remove. " At this age, they seem vulnerable, but they’re actually strong and healthy. The scientists have done this dozens of times and have never lost a bird. They’ll continue to monitor the growth of these babies using something called a PeeperScope – a camera on an extendable pole that can look into nesting cavities and take pictures. It’s a device that’s been getting a lot of mileage lately. This group of woodpeckers, which had been producing eight or nine fledglings annually, is now up to 25 babies a year. In Loudon County, part of Northern Virginia, scientists are doing big research on a very small insect. And the results could have major implications for how the brain functions. Millions of birds passed through Virginia this spring, and the National Wildlife Federation says many are in trouble, in part because of climate change. A warming planet is drying up wetlands, causing more storms and producing less food. Sandy Hausman traveled to the Eastern Shore to report on one species -- the rust- colored sandpipers known as red knots. Each year, they fly about 10,000 miles – from the tip of South America to their nesting grounds in the Arctic – stopping in Virginia to refuel. What’s now known as the “environmental movement” took root decades ago. Today, more young people than ever before are interested in careers in this field. But it’s a career path, which relatively few people of color choose to pursue. The College of Natural Resources and Environment at Virginia Tech held a national conference to explore the future of diversity in careers related to the environment. Dean Paul Winistorfer says more needs to be done to interest minorities in this growing field.